William Duffield was born in Bath in 1816. Initially he was a self-taught artist, but soon found the need for professional studies. He moved to London and entered the studio of George Lance (the still life artist), and then continued his studies in Antwerp with Baron Wappers. After his training, he returned to Bath and specialized in painting fruit, vegetables, meat and dead game. 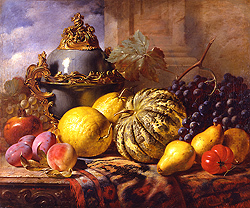 In the late 1840s he met Mary Ann Rosenberg, also a still life artist, and the two were married in 1850. For the next 13 years the two artists worked together and in 1863, at the height of his career, William died. Redgraves, in his Dictionary of Artists of the English School, states that Duffield … owes his last illness, to the earnest pursuit of his profession. He was painting a dead stag, which remained in his studio for that purpose until it became extremely decayed. Unfortunately the painter, from a prior illness had lost his sense of smell and in the presence of miasma, he continued to work unconscious of the danger, until infection took place which caused his death. During his life, William exhibited more than 60 works at the Royal Academy, British Institution, and Suffolk Street.